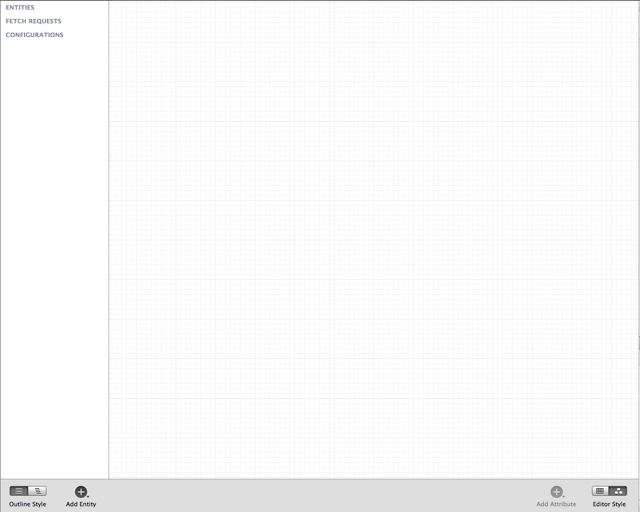 In this series, we’ve been creating an application called Orny. The application will (hypothetically) be used by Ornithologists to record sightings of birds, where those sightings occurred, and will possibly even store photographs taken by the user. At the moment, we’re listing some species of birds in an array. In the near future, we’re going to want to store data, so we’re going to make our app use CoreData. In this tutorial we’re going to cover the basics of CoreData, how to create a default database, and how to retrieve information from it. In the next article we’ll discuss how to store sighting data in the database – which will bring us close to having a useful application. The first thing we’re going to do is create a schema for our application. If you’ve worked with databases before, this should be reasonably familiar. 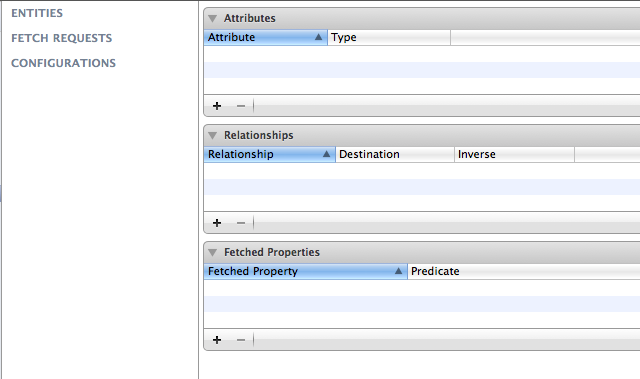 A schema is a collection of “entities” (often referred to as “tables” in the web development world). Each entity has attributes that describe it, and can have relationships with other entities. A “chair” entity, for example, might have four related entities called “legs”. You can access the specific legs of a chair entity using an accessor method like so: chair.legs (which would presumably return an array). We’re going to avoid getting into the nitty-gritty of entity relationships for now, but they’re not terribly complex. When we first created our project, we told Xcode that we wanted to use managed CoreData entities, so we already have a data model in place. Click on Orny.xcdatamodeld (this is the data model definition file). You can switch between them using ‘Editor Style’ in the bottom right. To add an entity, click the ‘Add Entity’ button. Create an entity called Species. 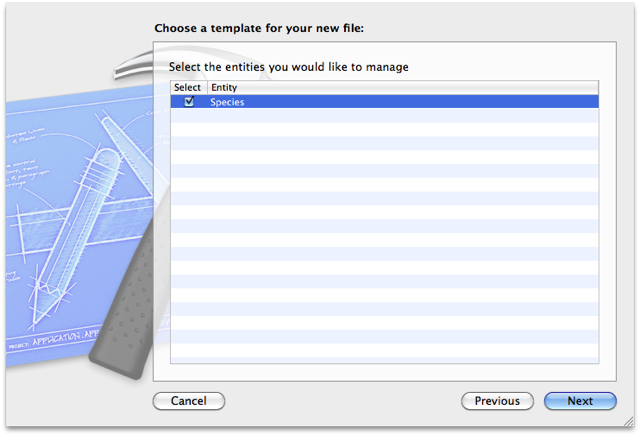 Click the ‘+’ button under Attributes to add some attributes – name, filename, and text_description. 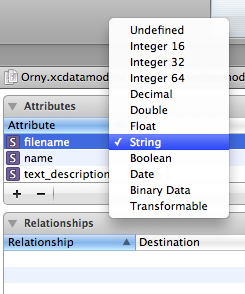 We need to specify the types of these attributes – they should all be strings. Next to each attribute, select the drop-down for type, and change them accordingly. 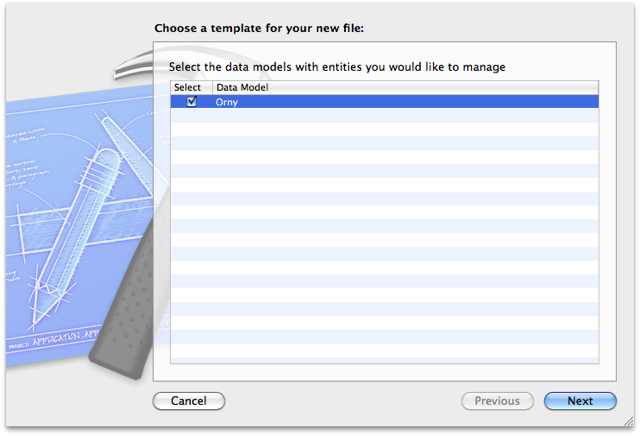 Right-click your new Models group, and click ‘New File’. 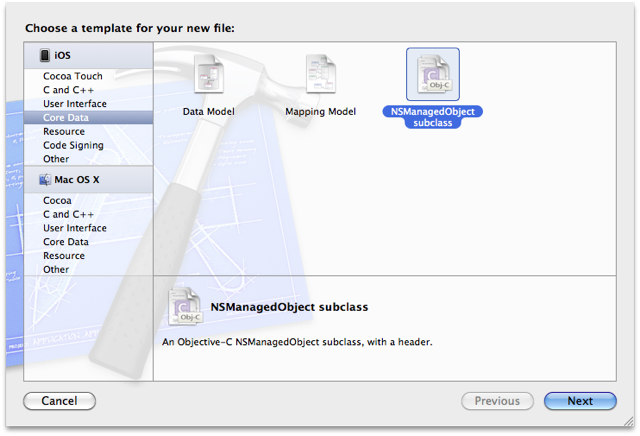 Select ‘Core Data’ and ‘NSManagedObject subclass’. 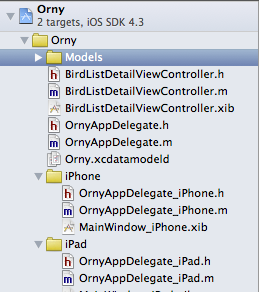 Hit ‘Next’, and select the ‘Orny’ data model. You can provide your own getters and setters if you wish, to enforce business logic on your model. It’s typically best to put a lot of your logic into the models, and leave the controllers as “thin” as possible – but this is a very simple class that we’re not going to modify yet. Our appDelegate already has most of the methods we need to access our database. Have a look at OrnyAppDelegate.m, and specifically the methods managedObjectContext, managedObjectModel, persistentStoreCoordinator and saveContext. persistentStoreCoordinator instantiates our database from a .sqlite file, and correlates the contents of that file with our managed object model via managedObjectModel. We’ll modify this later to copy in our database if none exists at launch (see below). managedObjectContext gets the managed object context (well surprise surprise! ), which is the correlation of the database file, the managed object model, and a controller that is used to fetch results and save data. NSManagedObjectContext is the class we’ll be interacting with most. // The context is, roughly, the "database schema"
There’s a fair bit going on here, but the comments should explain it a bit. In essence, we’re requesting a bunch of objects from the database where previously we were creating an ‘NSMutableArray’ to store that information. Ooh. We’ve changed the format of our data structures. Previously we’d call [birds objectAtIndex:someIndex] to get a particular “row” in our data set. We’d then call [species objectForKey:@"name"] or the like to get an attribute of that species. A dismal state of affairs, but there is a solution. We’ll make our app save a copy of our empty database, modify it to contain some data, and save our default database to our ‘Supporting Files’ group. Then, when our app runs, we’ll make it check to see if a database exists – and if not, we’ll copy in our default database. This approach works fine for a simple app, but be aware that if you subsequently want to add data to the database when you release a new version of your app, you’re going to have to do something special to merge your new data with the user’s existing database. One solution is to use two databases, one to store your app’s data and one to store your user’s. Further discussion goes a bit beyond the scope of this tutorial, however – back to the point! That magic string is automatically generated by the Simulator, so you might need to look at the last modified timestamps of the folders to work out which one is your application. Such a pain. 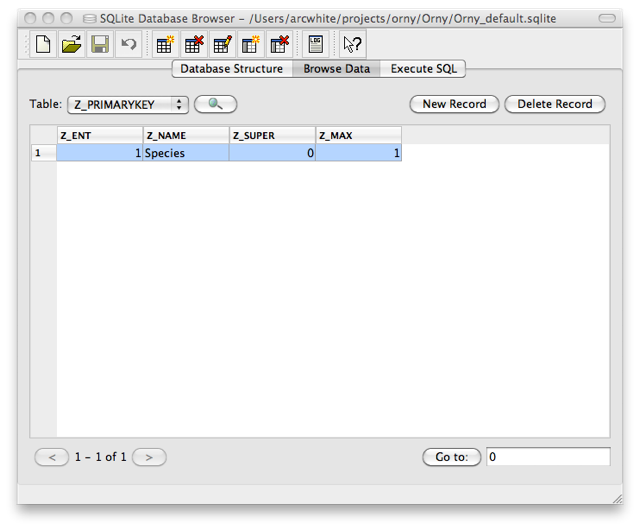 Once you have that .sqlite file, drag-and-drop it to your application’s Supporting Files group, and rename it Orny_default.sqlite. Now we want to modify the database file. I’m currently using SQLite Database Browser, but any tool that can read and modify .sqlite database files should be fine. 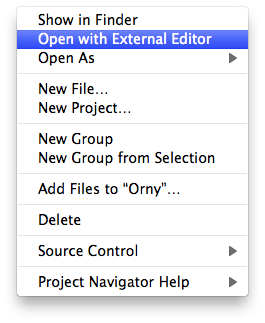 Once you have that app installed, you should be able to modify the file by right-clicking and selecting ‘Open with External Editor’. 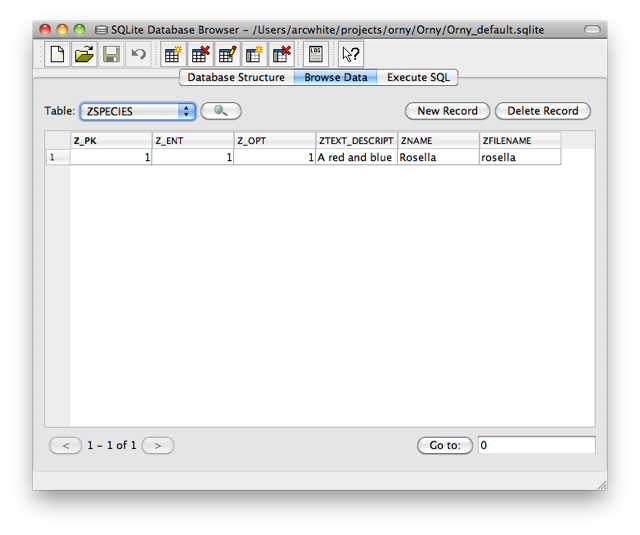 In SQLite Browser, hit the ‘Browse Data’ tab, and select ‘ZSPECIES’ from the table drop-down. Insert a row, as per Figure 13. With that done, we also need to modify the PRIMARYKEY table. This is where CoreData keeps a record of the Entities it’s managing for this database, the name of the Entity, and the number of entries in the database. Modify the Z_MAX column as per Figure 14. Hit the save icon, and we’re done modifying the database. We’re not quite done yet. We need to modify our persistentStoreController method on our AppDelegate to copy in our default database if none exists yet. I’ve truncated the listing above for brevity, but you can see the lines we’re copying in. I’ve also left some debugging method calls in place. I was having trouble copying the file in, and needed to see the relevant file paths that were being used. This is a quick and dirty way to get some debugging information, but it’s much more efficient to set breakpoints and use the debugger to explore these sorts of issues (we’ll cover that in another tutorial). Okay, run the application and you should be roughly back where we started in terms of functionality – but now we’re reading from a database. Go team! The default CoreData methods on our OrnyAppDelegate are heavily commented by Apple, and implement some very limited error handling for us. If you ever want to publish an app to the app store, you must read these comments, and handle errors elegantly. How you handle an error is up to you – you might re-create the database from scratch, or just show the user a message asking them to re-start the app, but you should definitely do something. I’ll leave that adventure for you! We’ve now learnt how to use CoreData to retrieve information from a database. We haven’t looked at how to modify data yet – we’ll save that for a later tutorial – but we’ve taken a big step to making our application more interactive in the future.